ABSTRACT Multiphase systems occur in many shock driven mixing problems such as the processing of cosmic dust in supernovae, combustion of fuel droplets in shock waves, nucleation of droplets in the late stages of steam turbines, and the production of ejecta from shock-boundary interactions. The interaction of a shock wave with a non-uniform multiphase field will result in the growth of a hydrodynamic instability similar to the Richtmyer-Meshkov (RM) instability but with a much wider parameter space. These instabilities are unique from the RM instability in that the particle-gas coupling and relaxation effects can significantly alter the behavior of the resulting hydrodynamics and can damp or enhance the interface mixing. This multiphase problem challenges our current computational capabilities as it requires compressible fluid equations, the use of multiple phases each with its own mesh, and energy, momentum, and mass coupling between the phases. The ability to predict these systems, though, is essential to our stockpile stewardship, national energy security, and understanding of our universe. This talk will present the initial results of an experimental and simulation campaign conducted in partnership with Lawrence Livermore National Laboratory (LLNL), and Los Alamos National Laboratory (LANL) to explore this shock driven multiphase instability. The talk will focus on results obtained with the Ares code (LLNL) for momentum and energy coupled multiphase simulations. These results explore the effects of a wide range of parameters and highlight the uniqueness of this instability compared to the classical RM instability. Some early results will also be presented from the FLAG code (LANL), and the FLASH code (U. Chicago) for simulations which include mass transfer, evaporation of the particles. BIO: Jacob McFarland is an assistant professor at the University of Missouri in the Mechanical and Aerospace Engineering Department. He received his PhD from Texas A&M University in 2013. 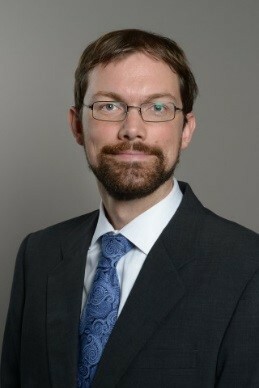 He was the recipient of two HEDP summer student internships from LLNL, and is a visiting faculty scientist with LANL. His current research interests are in shock driven fluid mixing and instabilities, phase change in compressible multiphase turbulence, and shock driven ejecta. No Refreshment will not be served.